San Mateo residents are invited to attend the fourth of four community meetings that will feature information about the proposed sewer rate increase for fiscal year 2017-2018 and general information about the Clean Water Program. The meeting is scheduled for Tuesday, June 6, in Council Chambers at San Mateo City Hall (330 West 20th Avenue) from 6:30 to 8:30 p.m. The meetings start promptly with a formal presentation and time for questions, followed by an open house with information stations. The meetings are an opportunity to learn about the Clean Water Program and proposed sewer rate increase before City Council considers the rate increase at a Public Hearing scheduled during the June 19 City Council meeting. The proposed increase is an across-the-board rate, affecting residential and commercial properties, as well as minimum charge rates. The Public Works Department will introduce the proposed rate ordinance proposal at the City Council meeting on June 5, and the Council will vote on it on June 19. The Clean Water Program is a multi-year capital improvement program that will upgrade our sanitary sewer system and the wastewater treatment plant to improve service, align with the City’s sustainability goals, and comply with regulatory requirements to protect the environment and public health for years to come. The proposed sewer rate increase is needed to help fund these necessary improvements in our city’s vital infrastructure. For questions about the Clean Water Program, please call (650) 727-6870, email info@CleanWaterProgramSanMateo.org, or watch this informative video. 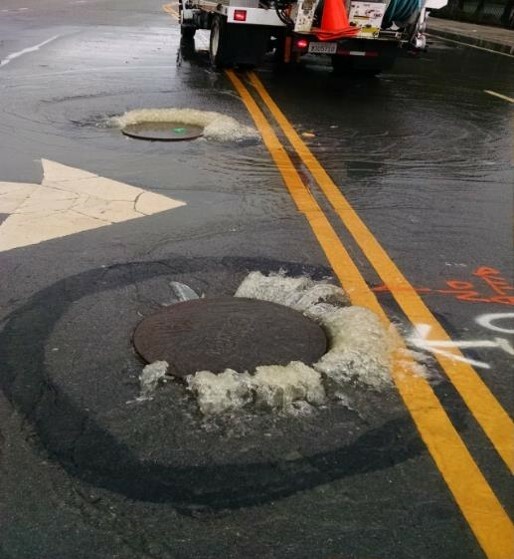 After heavy rains, raw sewage mixed with rainwater can cause overflows into the streets of San Mateo. Tuesday, June 6, 6:30 to 8:30 p.m.
Monday, June 5, 7:00 p.m.
Monday, June 19, 7:00 p.m. Results of the evaluations for the underground in-system storage facility location will be presented to the Public Works Commission and the City Council in June and July. The Council will be requested to select either the City’s Corporation Yard or the San Mateo County Event Center for the final site location of the underground facility. Reminder: Don't flush your unwanted medications! Instead, take them to a safe disposal facility. Click here to see the San Mateo County Health System website for a complete list of drop-off locations.